The property, a large, vacant tract just north of Sanford, was used primarily for hunting at the time of the taking, but the appraisers for both sides agreed the highest and best use was for residential development. The department’s two appraisers believed the property was worth $7,000 per acre and $7,200 per acre, respectively, before the taking. 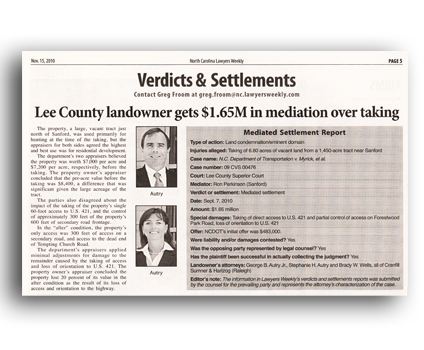 The property owner’s appraiser concluded that the per-acre value before the taking was $8,400, a difference that was significant given the large acreage of the tract. The parties also disagreed about the impact of the taking of the property’s single 60-foot access to U.S. 421, and the control of approximately 300 feet of the property’s 600 feet of secondary road frontage. In the “after” condition, the property’s only access was 300 feet of access on a secondary road , and access to the dead end of Tempting Church Road. The department’s appraisers applied minimal adjustments for damage to the remainder caused by the taking of access and loss of orientation to U.S. 421. The property owner’s appraiser concluded the property lost 20 percent of its value in the after condition as the result of its loss of access and orientation to the highway. Case name: N.C. Department of Transportation v. Myrick, et al. Offer: NCDOT’s initial offer was $483,000.